Duvetyne also known as Commando Cloth is a FR Brushed Cotton with a velvet like nap used as a Black Masking Fabric with the heavier weights used as a durable drapery fabric, blackout fabric. 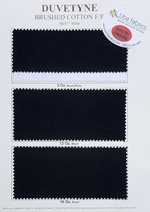 Best Quality FR (treated) Brushed Cotton in the marketplace! Available in 9oz, 12oz and 16oz in Black.